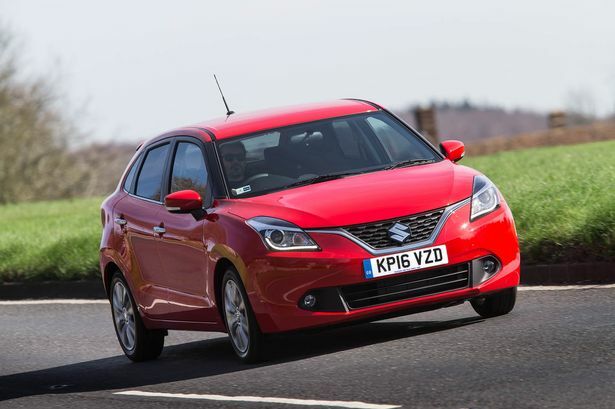 The Suzuki Baleno, introduced into the UK last summer, is far from boring with it’s 1.0-litre Boosterjet engine offering more grunt than you would expect. Driving a medium/large car with a small engine used to spell boring, tedious motoring – but not any more. Development in engine technology has seen a revolution in the car industry, with small engines now punching well above their weight. And nowhere is that more dramatically shown than with the stylish new Suzuki Baleno, introduced into the UK in the summer. Get behind the wheel and you would guess you were driving a car with a 1.8-litre engine, but under the bonnet beats the heart of one that’s just 998cc – not even a full 1.0-litre! Yet despite its diminutive size this newly developed Boosterjet engine offers exceptional performance with sharp acceleration and bags of torque while guaranteeing low fuel consumption, low insurance and budget priced road tax. Best of all it makes the Baleno the sort of car that you actually look forward to driving – it’s that good. The turbo-charged three-cylinder engine responds the moment you dip your right foot and can actually throw you back in your seat. And under hard acceleration you get a nice sporting throaty roar from the exhaust. Suzuki has earned itself a reputation for producing good small cars and the Baleno will certainly enhance it. Not that this model is really a small car. One size up from the manufacturer’s popular Swift model, the Baleno offers generous five-seater comfort with good headroom and the sort of rear leg room that allows passengers to actually stretch their legs out for long journey comfort. There’s a sensible sized boot too with some 320 litres of space with the rear seat backs in position and 756 litres with them folded down. And the bonus is this boot comes with a double-decker floor so it’s easier to load more items. The cabin is functional rather than flash and while there is rather a lot of hard black plastic there is plenty of kit even on the entry level model. My mid-range SZ5 came with climate control, satellite navigation, reversing camera, adaptive cruise control, electric windows all round and Radar Brake Support which applies the brakes if you don’t when a collision is unavoidable. There’s even a high definition colour screen with graphics showing the torque and power the car is putting out. Suzuki claims an average of almost 63 miles per gallon, which seems a little optimistic, but over a week’s motoring I registered a healthy 56 mpg. There’s keyless entry and push button starting to keep things simple and the Baleno comes with light but positive steering and a small turning circle ensuring parking is easy. In fact it’s a very easy car to drive, and that and its brisk performance is what will sell it to anyone who takes a test drive. The Baleno is just one of those cars you can’t help but like. It’s got everything going for it and comes at a sensible price. Mechanical: 998cc, 111 bhp three cylinder petrol engine driving the front wheels via 5-speed manual gearbox.